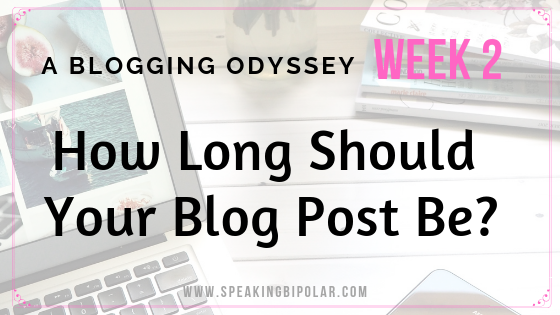 Welcome back to the next installment of A Blogging Odyssey: How Long Should Your Blog Post be? If you are new this week, this series documents my experiences as I work to grow my blog and audience. If you missed Week 1 – Taking a Proper Inventory by Analyzing My Blog you can read it by clicking this line. My name is Scott, and I’ve been blogging for a little over a year. My goal is to have a blog that helps individuals learn to talk about and live successfully with chronic and mental illnesses. Personally, I am coping with both Bipolar Disorder and Familial Mediterranean Fever. What is the ideal length of a blog post? That is one of the hottest topics in most blogging circles. Whether in WordPress Reader, Twitter, or Facebook, whenever there’s a group of bloggers, someone is likely talking about this subject. In this post, we are going to look at the pros and cons for various post lengths and then look at the reasons why I chose the length that is typical in my posts. Let’s dive in. What Is the Right Length for My Post? Here is the honest truth that many people won’t tell you: A blog post should be long enough to say what you want to say. That’s it. No big formula or scale to review. If you want to write about your cat fighting dust bunnies under the couch, and you can tell an amusing story in 500 words, awesome. Instead, you might want to talk about the benefits of daily sun exposure for Vitamin D and mental health, and that post might take 3000 words. Both lengths are perfectly fine. Now you’re probably asking, if there is no ideal blog post length, then why all the discussion about it? There are a few reasons. While most blog followers read several different blogs, your readers are in many ways unique to your blog. They are following you and reading your posts because they like your voice, the tone of your message, and how it’s delivered. If you have always published posts in the 500 word range, you may lose some readers, or at least they won’t read the whole post, if you suddenly start pumping out 2000 words for each topic. However, if your readers are in for the long haul and already devouring 2000-3000 word posts and you suddenly start popping out 300 words posts, they may feel cheated and be disappointed with the new short post length. What Is Your Blogging Strategy? 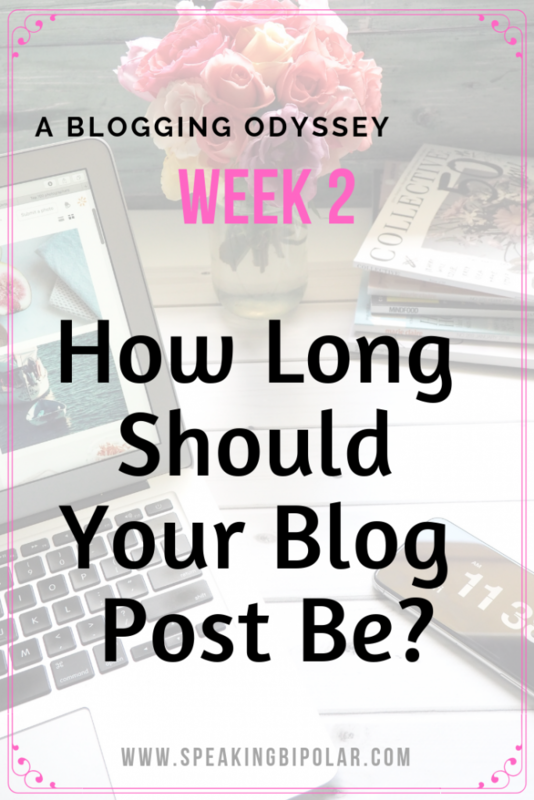 Another item to consider in blog post length is your blogging strategy. Many bloggers write what they want to write, when they want to write it. Their readers love them for that and are happy to keep reading their eclectic approach to blogging. On the other hand, there are bloggers who are deeply concerned with growing their audience and getting the most traffic possible. 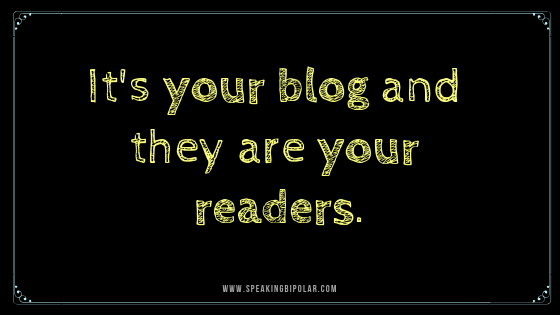 If you are one of those bloggers, there are a few things you should consider. One big item to think about is SEO. I will go into more detail about SEO in another post. For now, all you need to know is that SEO stands for Search Engine Optimization. By carefully planning each post, you have a better chance of your blog showing up in internet search results when someone is looking for information on your topic. The more you show up in search results, the more traffic you will see on your blog. Brian Dean at Backlinko has become one of the leading voices in the SEO world. Brian spends a lot of time experimenting, researching, and optimizing search results. What has Brian found in his analysis? What did they find after reviewing all those posts? Here’s a few brief snippets. First, long-form content, or posts in the 1000-2000 word range, get 77% more links than content with less than 1000 words. Second, longer content is much more likely to be shared on social media. Surprisingly, most blogs are NEVER shared. The study found that about 94% percent of blogs get no social media shares. Third, longer headlines (14-17 words) tend to garner better than 76% more social shares than short titles. The article is fascinating and definitely worth the read if you are interested in increasing traffic to your blog. You can read the entire post here. One last interesting tidbit, if you go to Brian’s site, you will see that the post referenced here is just under 3,000 words. Since Brian is a leader in the field, that’s something worth thinking about when considering your blog’s future. Will People Read Long Blog Posts? Another very kind blogger reached out to me recently and shared some of her insights. She has found that in today’s digital world, many people, maybe even most people, don’t really like to read. Knowing that, she has chosen to keep her blog posts short, and her readers like the shorter content. That discussion got me thinking, though. Will people read long blog posts? I considered this question from a couple different angles. 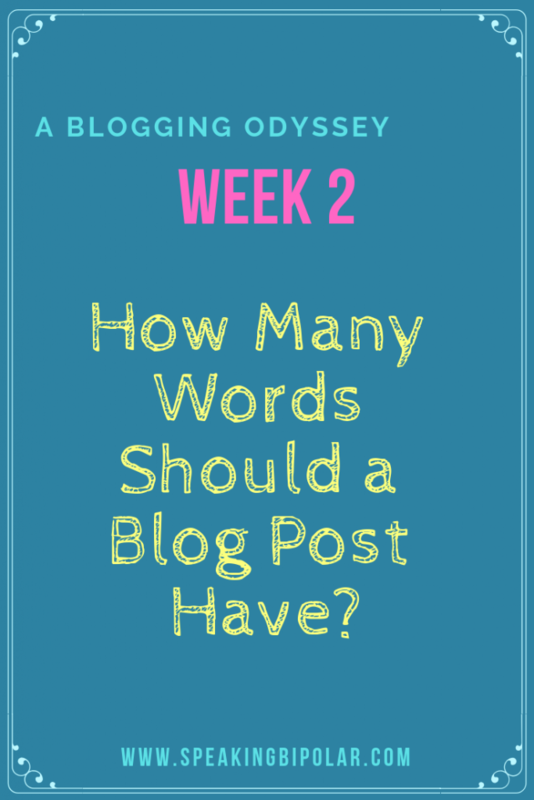 For me, the determining factor of whether I read an entire blog post, and I visit a lot of blogs every week, isn’t so much about post length as it is about the quality of the content. If an article is well-written and entertaining or informative, I will usually keep reading until the end. For instance, I read all 3000 words of Brian Dean’s post. On the other hand, if the content is poorly written, full of grammar and spelling mistakes, or just plain boring to read, I likely won’t make it past the first few sentences. What do you find when you visit other blogs? Second, I looked at my own blog and which content is most popular. My most popular posts by far are 12 Signals That Point to Bipolar Disorder and Speaking Bipolar – A Mental Illness Translator. Between the two of them, they average about 3000 page views every month and have done so consistently for the last several months. What is the content length? The word count is 2301 and 1625 respectively. Now in all fairness, I love writing. As a result, my blog posts tend to be wordy. Once I start writing, it’s often hard to stop. To test this concept, some of my newer posts, such as Living Successfully With Familial Mediterranean Fever – An Introduction, are at right around 1000 words. It will be interesting to see how they perform in the coming months. The first lesson is that your blog is just that – your blog. There are no rules or blog police that are going to come hunt you down if your word count is too long or too short. The second lesson to remember is that your readers are your readers. They are coming back to your site and reading your new posts because they like you and what you have to say. Don’t let anyone pressure you into saying more or less than you feel like you need to say on a specific subject. If you cut yourself short or drag things out just because you are obsessed with word count, that is going to come across in a negative way to your readers. Instead, pick your subject, and write what you need to say about that subject – whether it’s 500 or 5000 words. Note: I must interject here, if you are using WordPress for creating your blog posts, it tends to get a bit squirrely if you get up around the 5000 word mark. If so, and you’re not done writing what you want to say, consider breaking your content into two or three consecutive posts. 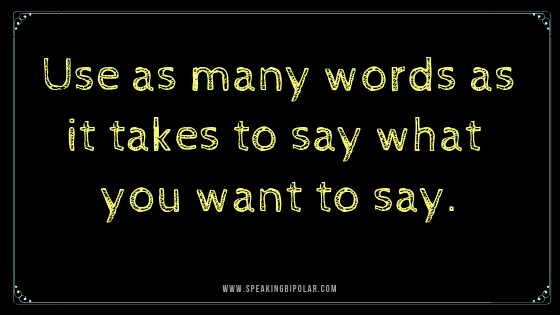 Thank you for visiting me again at Speaking Bipolar and for coming along with my on my blogging journey. If you enjoyed this post, please check out some of my others like What Is Mindfulness? How Can It Benefit Your Life? or How To Be Happier: Change Your Mental Illness Perspective. Blogs audiences grow the quickest through readers sharing, so please also share this post with others and on social media. Is there a topic about blogging that you would like to see addressed? Please leave a comment below or send me a message through the contact page. Thank you for being a loyal follower. So maybe the issue I was mentioning is merely about the people that don’t actually read and not the post length and this is something we can’t control, but I’ll certainly write all what I want to say regardless how long it can get even though I’m sure my English needs lot of improvement and hope it will always gets better. Thank you so much for coming back and commenting. I don’t read Arabic, but if you want to translate, I would love to read the articles. Might be something you could post on your blog. Your English is better than many people who speak it as their first language, so don’t worry about that. In regard to people not wanting to read, I’m considering posting an audio of the post at the beginning of the article. I don’t know anything about recording audio, but I wonder if people would like that. Any thoughts? Hi Scott. Your key message is spot on. Stats about the most successful length of blog posts are mostly derived from business or would-be commercial blogs, and so don’t make much sense for personal blogs like ours! You are exactly right. Thank you for commenting. Hey Scott, that is a really informative post. I don’t tend to follow any rules in truth, l am by nature a long content writer, but equally l produce short content too, personally l prefer the latter as that is what l tend to read. If a content piece is boring l will usually shut down from it after paragragh six. People will read what they want to read, long and shirt of it, some short content readers will read lomng content and some long content readers will read short content. There is no secret, no magic formula – l have just read your long post, and many will have stopped after the first section, but hit like anyway.